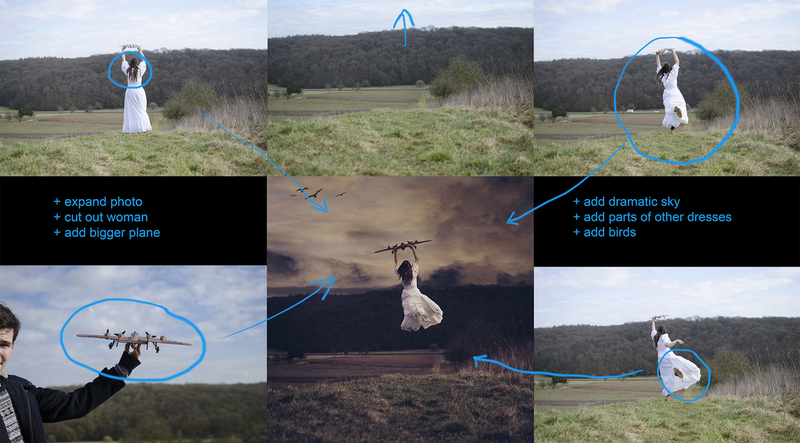 I still wanted to show you a Before & After / Explanation of how I edited my photo for week 8! The theme for this week was "Sky" and believe me, I had so many ideas for a photo! So because it looks like I am barely off the ground, I ended up having to completely cut myself out of the background and move myself higher after expanding the photo. To make it look realistic, I had to add hair and parts of the dress from other photos. I also had to exchange the plane which I was holding with a larger version of it. Then I "only" had to add a new sky and the birds, change the tones and colours and I was done.